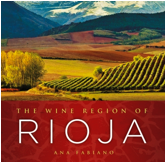 “Finally, Ana Fabiano has given us the definitive book on Rioja, one of the world’s most exciting wine regions. Highly recommended.” --Robert M. Parker, Jr.
For immediate release (New York, NY) – Hailed as the wine region of 2011, Rioja is finally getting the credit itdeserves. Riojan wines, some of the world’s best, are now readily available in the United States and Americans are going crazy for them. In THE WINE REGION OF RIOJA (Sterling Epicure; June 5, 2012; $35.00/Hardcover), the first American-published book devoted exclusively to the region, noted Rioja scholar Ana Fabiano pays tribute to Spain’s most vibrant and prestigious wine region, one that is at once traditional and innovative. In this beautifully illustrated volume, with more than one hundred color photographs and detailed maps, Fabiano takes readers on a journey through Rioja’s valleys, mountains, vineyards, and towns, providing a thorough overview of its bodegas (wine cellars), grape varietals, wines, and producers. With captivating descriptions of Riojan wine, history, and culture, backed by scholarly research never before published in English, The Wine Region of Rioja explores both the heritage and the future of an exceptional wine region. In the chapter “La Rioja: A Magical Place,” Fabiano acquaints the reader with Riojan geography, detailing its valleys and mountains with transporting descriptions and enchanting full-page photographs. In the chapter “Monasteries, Mystics, and Mountains,” Fabiano traces the roots of Rioja to the 9th and 10th centuries, when monks planted and tended the region’s first vineyards. The heart of The Wine Region of Rioja, however, covers the terroir, grape varieties, and producers in the region. Fabiano brings to life the winemakers of the region with profiles of Riojans like Jesus Martinez Bujanda, a fifth-generation winemaker, and Maria Martinez Sierra, who was inspired to start producing wine after uncorking a secret buried stash of still-delicious Tempranillo bottles a friend had buried years earlier. Fabiano goes on in “Categories, Styles, and Regulation” to describe the different aging methods, types of oak barrels, and classifications of Rioja wine, explaining Cosecha, Crianza, Reserva and Gran Reserva. Fabiano’s “How to Read a Rioja wine label” is particularly helpful for new Rioja drinkers and “The Grand Old Bodegas of Rioja” will help readers navigate Rioja’s oldest wineries and their wines of note. “Rioja on the Modern Table” provides tips on pairing Rioja with food, and Fabiano offers wine suggestions for everything from cheese to Asian food, as well as recipes such as Pears Poached in Rioja and Tomato Tartare with Langoustine and White Garlic. The Wine Region of Rioja is the most comprehensive book on Rioja wines to date – as well as a fascinating insider’s perspective on a magical and culturally-rich place. It is the first book to capture the spirit of this breathtaking, important and exciting wine region, as well as reveal two Riojas: one steeped in a grand past and the other undergoing a modern renaissance. Hi thanks for this post. I've added this book on my to read list.